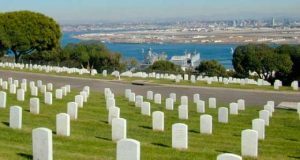 Located in San Diego overlooking Fort Rosecrans U.S. Military installations, the cemetery is located about ten miles west of San Diego, providing scenic serene overviews the bay and the city. Most Fort Rosecrans burials have roots in the past years of the California Territory, including burials of casualties of the battle of San Pasqual. There after the United States Of America began war on Mexico in May 1846. In the Battle of San Pasqual, 19 men and an unknown number of Californians perished. In the Beginning, the casualties were interned where they died, in 1874 the remains were removed to the San Diego Military Reservation. 8 years later, the remains were again re-interred at what is now Fort Rosecrans National Cemetery. Fort Rosecrans became a National Cemetery on Oct. 5, 1934. Based on Department of Veteran Affairs in excess of 91,000 burials reside on these 77.5 acres. It is hard to trace the origins, of what has become, as much of a urban legend, as possible haunting. It is clear, that some people have had, experiences they believe to be paranormal. civilians, USN, and USMC personnel all have claimed experiences. Paranormal occurrences include, voices and odd sounds not usually associated with the location. After dark, claims have been made, to see hazy translucent figures, always at a distance.